Originally planned for mid December, but conditions on the day meant that the walk waited until more favourable weather. Even so at the time of arrival for the start at Wombat Moor it was quite cool and the peaks were all under cloud. We turned off the track before reaching the Woodland Mosaic and gently ascended over the wet moor, avoiding where pineapple grass wherever possible as it makes for uncomfortable walking. A wooded ridge edge was reached after 20 minutes and this was skirted until an easier descent point could be found and then it was through the woodland, over a small creek and finally into the narrow northern end of Monash Valley (an unofficial name, but seems appropriate as it sits at the foot of the summit plateau of Mount Monash). It was soon after this that the scoparia started to become noticeable with many waist high bushes in a very healthy state flowing in many colours. There were bushes of a variety of shades of pink, various reds from dark through to rusty, then there were the whites and creams. 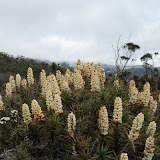 Quite some time was spent just wondering through this area, but it was not just the Richea as so many other plants were in flower as well; such as Orites, Boronia, Waratah and Epacris. Lunch was at the southern end of the valley before turning west and finally north over the Boronia strewn upper plateau on the way back to the car.